I recently saw some posts in the InMoov forum talking about how the supply lines are very important to being able to power the servos properly. My initial reaction was that the resistance of the wires going to the servo motors should be negligable. I mean, after all , it's wire.. it's copper.. it's a conductor. When we think about circuits we always consider that the wires don't have any resistance at all. They're ideal conductors, if you will. My new years resolution is to really get a good understanding of industrial robot arm control with the hopes to come up with some dynamic control to keep robots balanced and borg that into MRL. 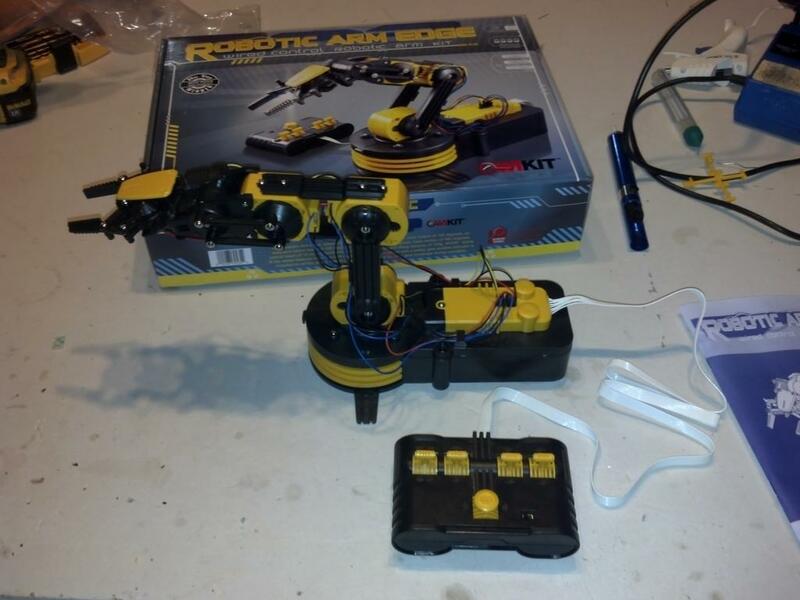 I recently picked up a robot arm kit from OWI. It's a 5 degree of freedom robotic arm. It took about 2.5 hours to assemble. I've been working through getting a kinematic model for the InMoov, recently, I stumbled across a python library based on the matlab robotics toolkit. It uses NumPy for much of the heavy lifting math operations. Did a quick simulation with MRPT of what I believe is a resonable approximation of the InMoov arm. This is really a page to talk about how to measure the actual angle that a servo has reached, rather than the last position the servo was told to move to. The aim is to be able to allow the servos to automatically configure their actual max/min angles. In addition, it should allow for quicker response to the stop() method. The stop() method stops the sweeper that is currently running for the servo. However, this only tells it to stop the sweeper, the servo will continue to move to the last position it was told to go to.